Peanut Butter and Jelly Frozen Yogurt Bars - drizzled with chocolate! Peanut Butter and Jelly Frozen Yogurt Bars - drizzled with chocolate! 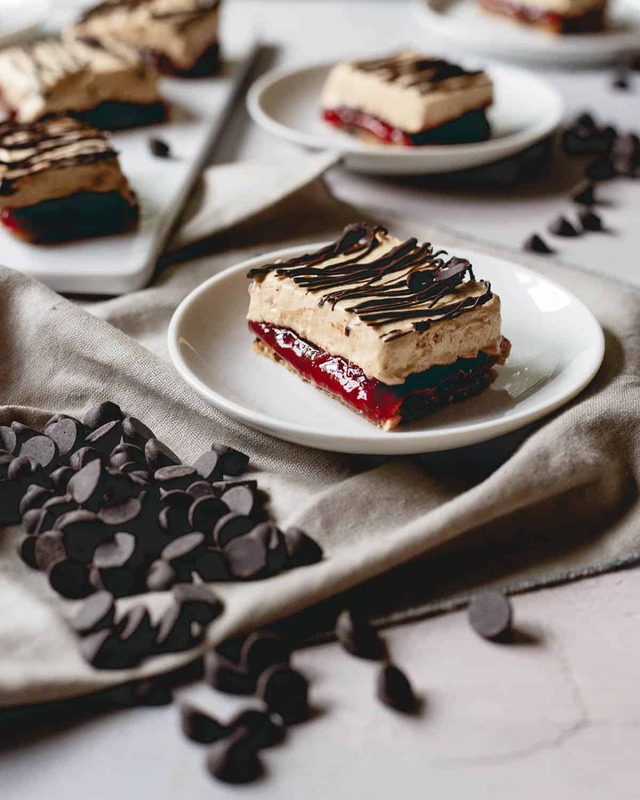 These peanut butter and jelly frozen yogurt bars have a chewy granola bar base and layers of sweet strawberry jelly, creamy peanut butter yogurt and a chocolate drizzle topping. I think most people hear peanut butter and jelly and immediately think back to their childhood. It’s a nostalgic combination found in many a lunchbox (although with the insane amount of nut allergies today, I don’t know how true that is any more) that pretty much instantly puts a smile on your face. *These peanut butter and jelly frozen yogurt bars are sponsored by Enjoy Life Foods. All content and opinions are my own. My brother and I were the weird kids in the minority on this one though. With a mom who despises peanuts and literally never had peanut butter in the house, our lunch sandwiches were primarily cream cheese and jelly (a combination I didn’t realize wasn’t normal for a solid 2-3 years of school), cream cheese and tomatoes (even weirder, thanks, mom) or simply cold cuts (and not the standard bologna kid sandwich, we got turkey instead). Oh, and wheat bread, always with mustard. Mom wasn’t a fan of mayonnaise either. It’s kind of shocking looking back at it that we weren’t ridiculed more, all (lunch) things considered. So while I might not have that same childhood nostalgia attached to the classic peanut butter and jelly combination, I’ve done my best as an adult in charge of my own pantry items to make up for those years without and can now say I have a pretty good grasp on the love affair people have with it. The thought behind these peanut butter and jelly frozen yogurt bars was to take that childhood nostalgia and turn it into a fun summer treat. Of course, with some chocolate because who could contest that addition? Besides my husband, the weirdo non-chocolate lover (I’m rolling my eyes as I type that). There are four distinct layers to this bar and it’s really hard for me to pick a favorite. The base is like a chewy (the best kind!) granola bar (which makes me think of these tart cherry oat bars and now I want to make a batch! 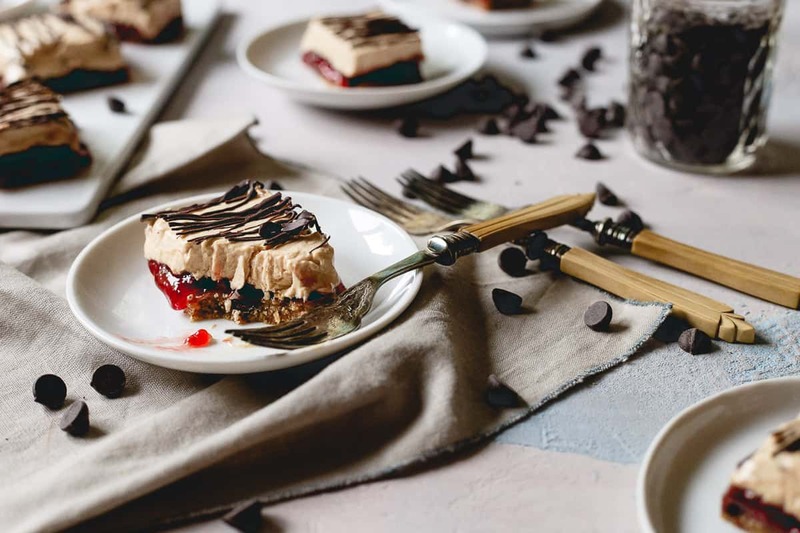 ), made with peanuts, oats, dates, creamy peanut butter and studded with my favorite Enjoy Life dark chocolate morsels, I could easily be happy just eating this layer alone. Then there’s the jelly layer. I used strawberry jelly and while I know grape is the more classic choice, I just prefer strawberry. It’s what we ate in my house growing up and it’s always my go-to. This layer is just jelly though, so feel free to pick your favorite kind. I love its sweet fruity simplicity. I could just as easily eat a good jelly or jam (like this strawberry chile jam) by the spoonful from the jar as I could the peanut butter so I really love this layer too. Vanilla fig preserves would be so delicious too! The creamy peanut butter yogurt is next and this is the layer that makes it a fun summer treat. It’s basically like eating ice cream in the middle of your snack since these bars are frozen. I used 0% plain Greek yogurt for these but feel free to make it even creamier by using 2% or full-fat yogurt. I love the subtle peanut flavor the peanut butter powder brings, combined with vanilla and maple syrup, this layer is pure decadence. I hate to make this comparison, but if you’ve ever had a frozen Snickers ice cream bar and can remember the taste of the ice cream part, that’s what this tastes like. Yep, I went there. I actually want to turn this layer into a frozen yogurt ice-pop because it’s that good on it’s own. The dark chocolate drizzle caps things off perfectly because if there’s one combination that rivals peanut butter and jelly’s reign at the top, it’s peanut butter and chocolate. I’ve used Enjoy Life chocolate chips for years now. Back when I was dabbling in paleo for the first time, I saw people mentioning their dairy-free, nut-free, soy-free chocolate all over. I bought them to allow for some “paleo acceptable” treats and never looked back. I use their mini-chips for snack balls like my no bake peanut butter chocolate chip balls all the time and the bigger morsels are great for everything from baking to these peanut butter and jelly frozen yogurt bars. So, yes, they might be a little bit time consuming, a bit more work for each of those four delicious layers, but I promise you they’re well, well worth the time and effort. Childhood nostalgia never tasted so damn good. Love this recipe for peanut butter and jelly frozen yogurt bars? 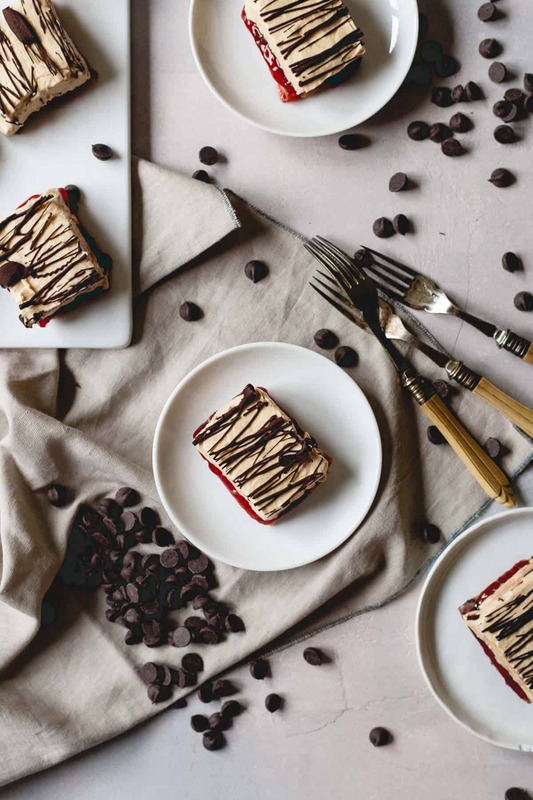 Try these other recipes: Frozen Strawberry Topped Peanut Butter Chocolate Chia Pudding, Frozen Chocolate Cherry Bars and Roasted Cherry Chocolate Chip Frozen Yogurt. Combine the peanuts, oats, dates, peanut butter, vanilla and salt in a food processor. Process until finely chopped. Slowly add water to the mixture until it starts to form a ball in the food processor and sticks together when pinched. Transfer the mixture to a bowl, add in the chocolate chips and stir until combined. Line a baking dish with parchment paper so that it overhangs the sides and transfer the mixture into the dish. Spread out evenly pushing the mixture into the corners with your fingers. Transfer to the freezer for 10 minutes to set. Spread the jelly on top of the base layer evenly and put back in the freezer for about 30 minutes until firm. Combine the yogurt, peanut butter powder, vanilla and maple syrup in a bowl and mix until well combined. Spread out on top of the jelly layer evenly and return to the freezer until frozen solid, at least 2 hours or up to overnight. Melt the chocolate chips and coconut oil in a small bowl. Mix well until smooth and drizzle all over the top of the bars in the baking dish. Return to freezer for 5 minutes to set. Remove the bars from the baking dish using the parchment paper to pull it out. Cut into bars and either eat immediately or keep frozen in an airtight bag or freezer safe container. oh my goodness, these look amazing!! My husband is crazy about PB&J (like eats one every day for lunch, crazy) so I just might have to try these!! So funny Gina, because I never, not once, had a peanut butter and jelly sandwich for lunch growing up either. I don’t think I had my first PB&J until I got married! My husband loves them and enjoyed them all the time growing up. I would totally enjoy these bars though, because now I;m totally a fan of PB&J! These look scrumptious! Love the added chocolate. Haha, I thought I was the only one! 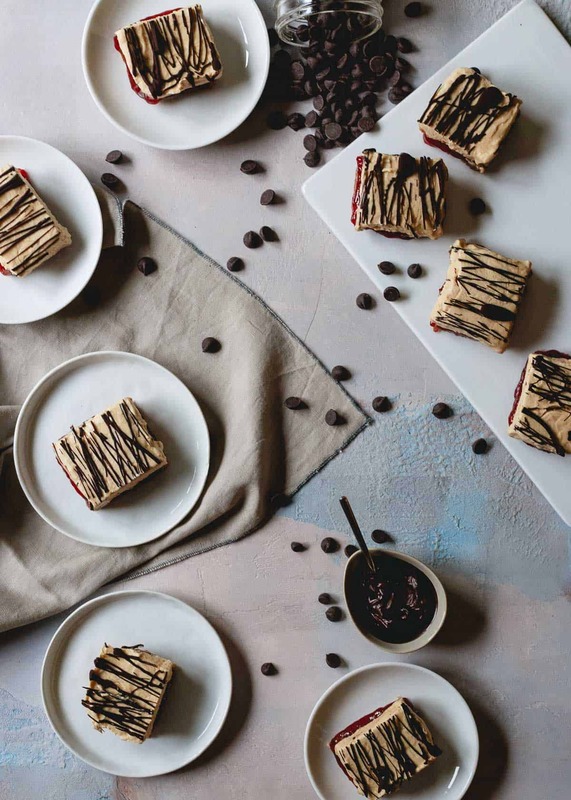 I love using Enjoy Life chocolate chips and these bars look incredible! They are the perfect sweet treat for summer. 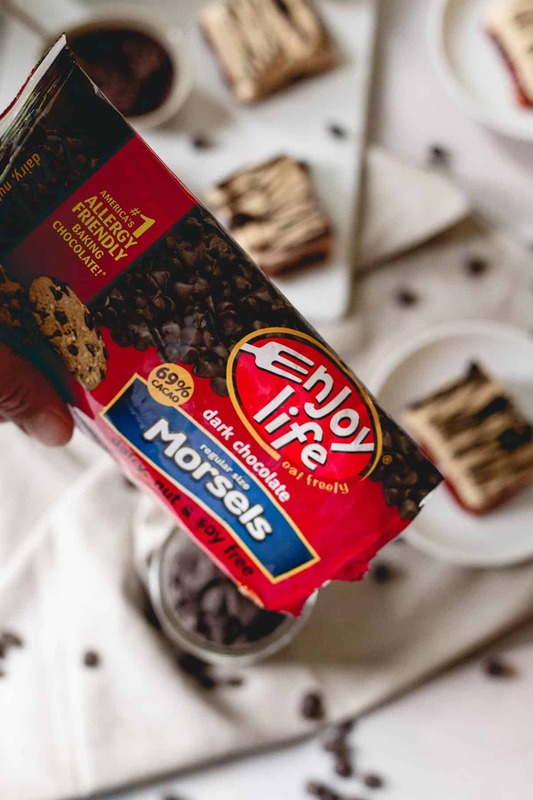 these yogurt bars looks so good and I love the Enjoy Life dark chocolate morsels!!! This look insanely good. I love peanut butter and jelly anything! These are so fun and what a perfect combination of everything we love here! Can’t wait to make these for my boys! Pb and J is my FAV…and I love Enjoy Life. Totallllly making these this weekend! Holy mackerel…these look too good! Quick question– what size baking dish did you use? I used a rectangular one about 6×10 in size. An 8×8 would also work.